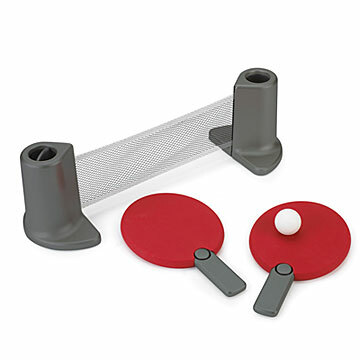 Perfect for impromptu tournaments, this travel table tennis set is ready to bounce whenever you are. Can't compromise with a coworker? Reliving sibling rivalry on vacation? Ping-Pong: The perfect conflict resolution. Put an end to the back-and-forth over a smart game, fair and square--just keep this go-anywhere set handy. A portable, retractable net, adjustable paddles and two ping-pong balls comes in a drawstring pouch for easy travel and storage. Net expands up to six feet. Made in China. Instructions included (English, Spanish, German and French). I am reviewing this product in the hopes of getting the advertised $1000 gift card. That said, my nephew loved it - he's 24, it was a christmas gift. Very versatile! The kids love it. This was a spontaneous extra Christmas gift for our two boys, ages nine and 15. We travel every year several times, so we picture taking this with us on trips. It works great on a square table, but the kids have set it up in a doorway with a wood floor, and it works great. Seems sturdy and very versatile. I would definitely try this again. Perfect for the avid ping pong player! Easy to set up Compact storage when not in use Fit perfectly on his kitchen island Whole family enjoyed it, even my 6 year old! My dad thought it was the best gift ever. He could play his favorite sport with his grandchildren, daughter, and son-in-law! Very cool table tennis any where you want it. We had a pretty expensive ping-pong table, but it broke in a military move...this turned out to be perfect, and high quality! I'm so glad we have it now, because it is portable and will hold up to many games in the future, on any table we own. There will also be many moves in the future, and this will be something that is simple to move. All of a Sudden--Table Tennis! The life of the party sometimes brings The Party. When my son showed up at a school in a far off land, he announced that he could transform a table into a site of fierce competition and hours of fun. He's made friends around that table, thanks to this nifty and clever game. It made dad happy and son (already cool) even cooler.